Two CD edition. 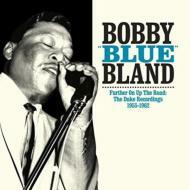 This 2016 compilation from Southern Routes presents a powerful set of Bobby Blue Bland's sublime recordings for Don Robey's Houston TX-based, Duke Records, originally released from 1955 through the end of 1962. During this term his music was a tour de force, Bland's powerhouse vocals backed by savage, slashing guitars. He delivered hit after hit and by 1961 with the release of his legendary LP Two Steps From The Blues (included herein) Bobby Bland had redefined Texas electric blues and Southern soul simultaneously. This is excellent, essential music - without a doubt, some of the greatest blues and soul material ever recorded. 57 tracks.